Hello everyone! 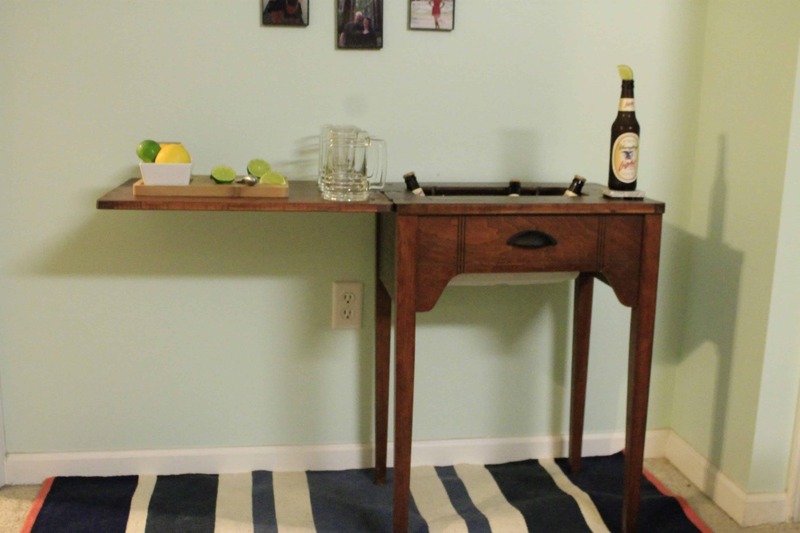 We are so excited to share this sewing table to bar table transformation with you. 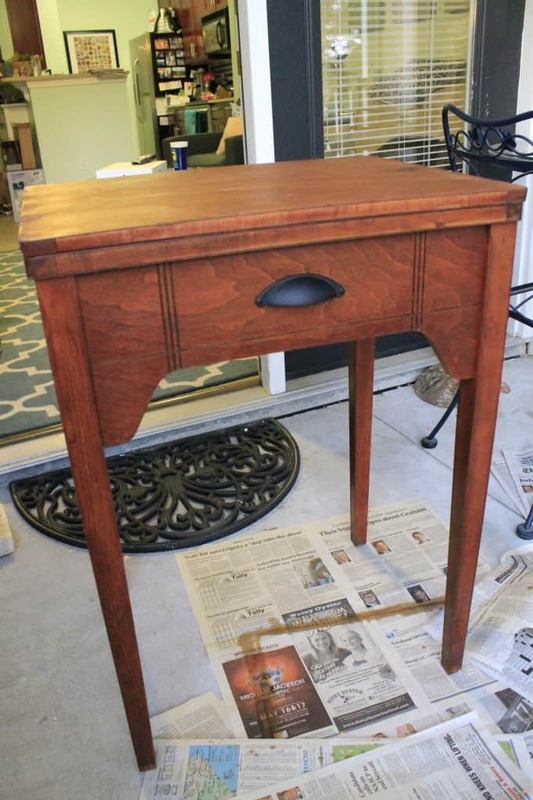 We paired with Goodwill Industries of Lower South Carolina (Palmetto Goodwill) and will be working on one furniture update or upgrade piece for them each month! It’s so exciting to pick out fun or unique pieces that we might otherwise not have the space for and totally make them over. Then we donate them back to the Palmetto Goodwill! 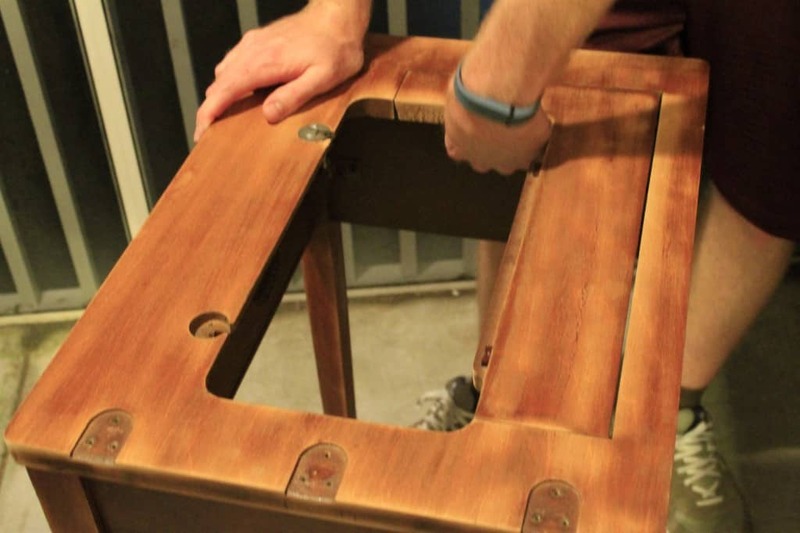 The main goal here is to take a run-down piece of furniture from them that they wouldn’t be able to sell for much and add value to it by re-purposing it so they can make more money! Morgan has been shopping at the Palmetto Goodwill on Folly Road for as long as we’ve lived on James Island, It is a great treat to be able to work with them. Be sure to click over and add their blog, Trendy Thrifty Now, to your readers or bookmarks! On our first trip to Goodwill to meet the managers, we looked around the store to see what we could find for our first renovation. There wasn’t a whole lot of furniture that day. Sometimes it can be hit or miss and you’ll want to try again. But there was a neat looking wooden side table. For our first project, we really wanted to select a unique piece. 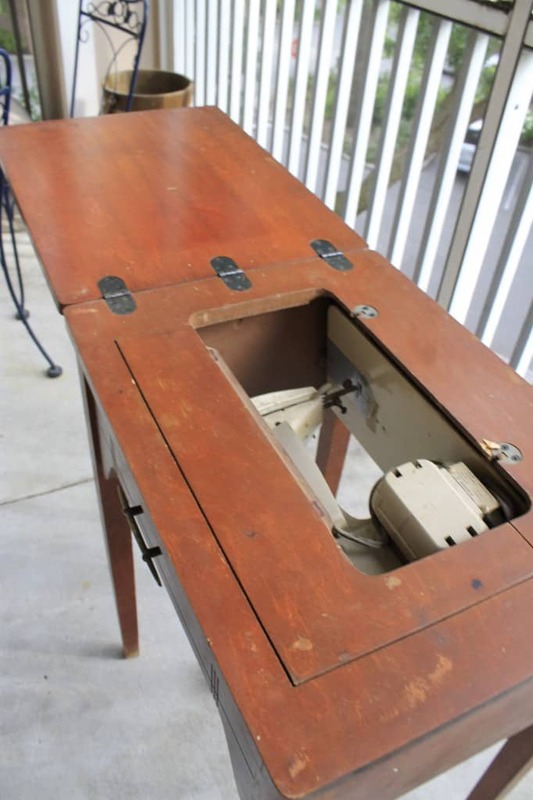 So imagine how excited we were to discover that it was actually an antique sewing table! The top was in rough shape, and the sewing machine was non-functional. But it still had tons of potential. It was selling for only $15, so there was a lot of upside. We took the table home and the first thing we did was disassemble it. 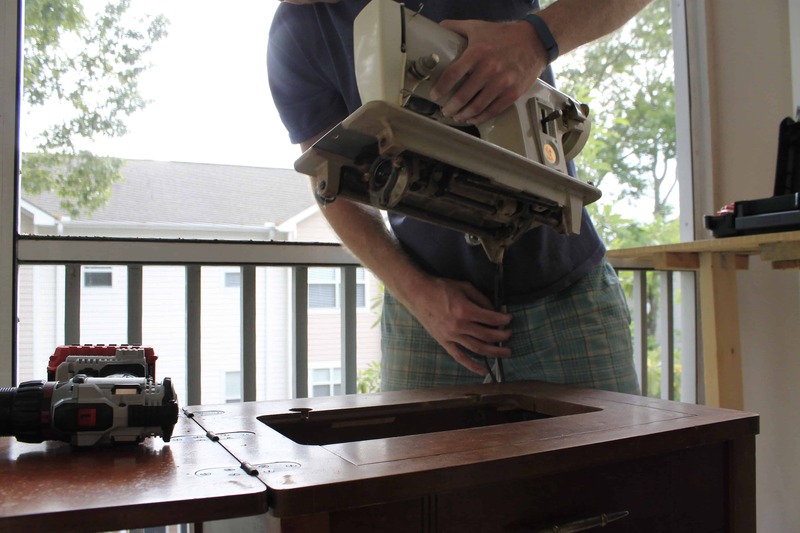 This included taking off the top folding board to make it easier to work with, taking off the existing handle and taking out the sewing machine. Like we said, it didn’t work and wasn’t a precious antique, so we got rid of it. Next of the sewing table to bar table transformation was to sand the entire thing. 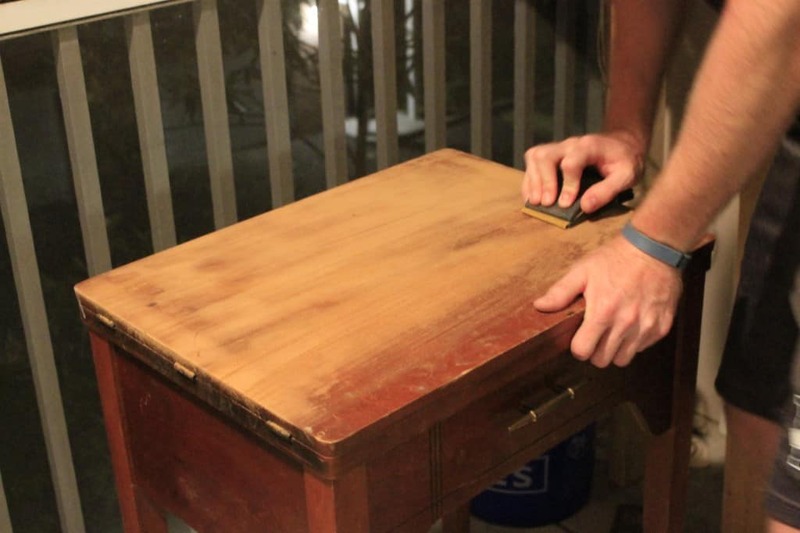 There is a unique smell (and taste) to sawdust from old wood, so make sure to use a mask if you do this on an old piece of furniture. 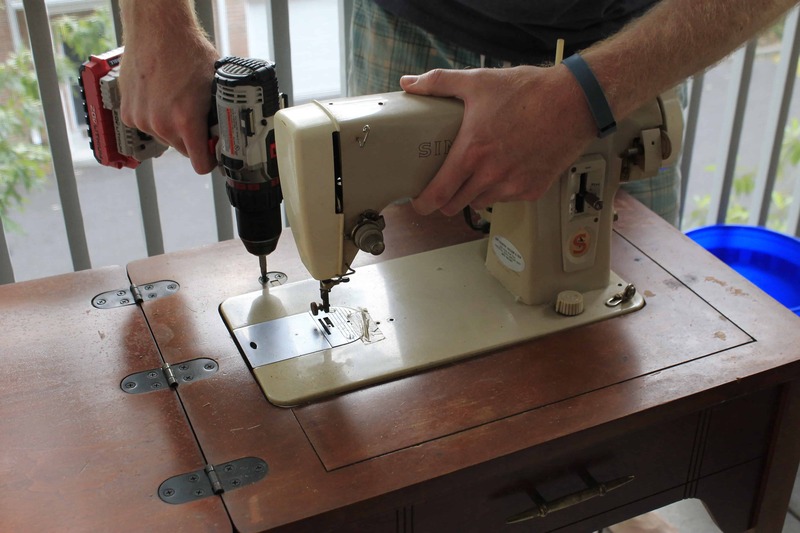 The table was already looking better, but we had to transform it into something else since the sewing machine was gone. 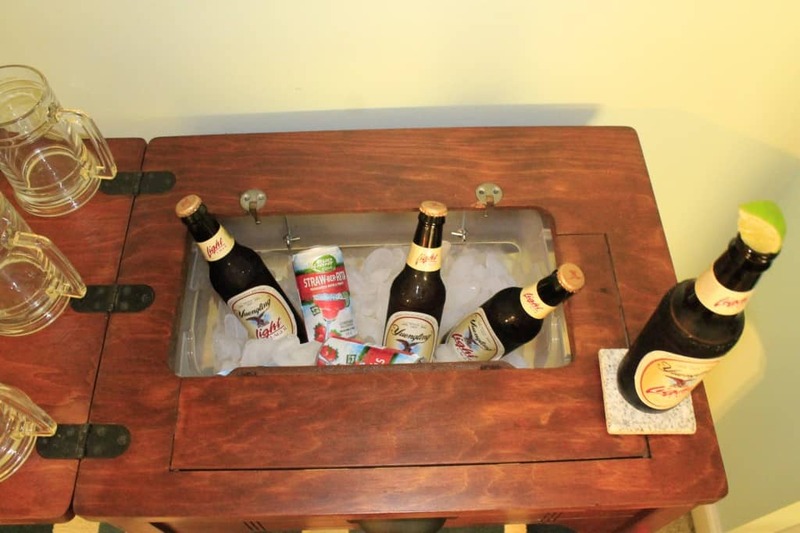 The unique hole in the middle of the table and the fold out side gave us the idea to turn it into a hidden bar table! 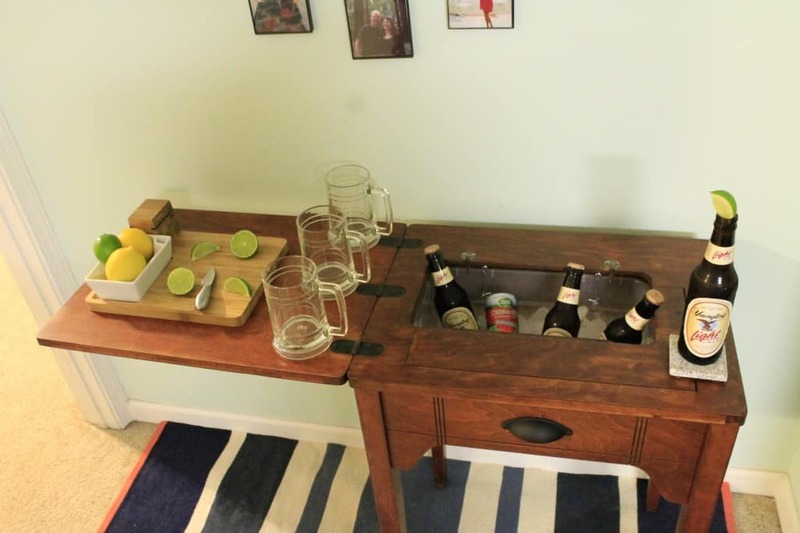 It would be a nice table when closed, but you could open it up and serve your guests during a party! We went to Walmart and got a plastic storage bucket that was just barely larger than the hole. 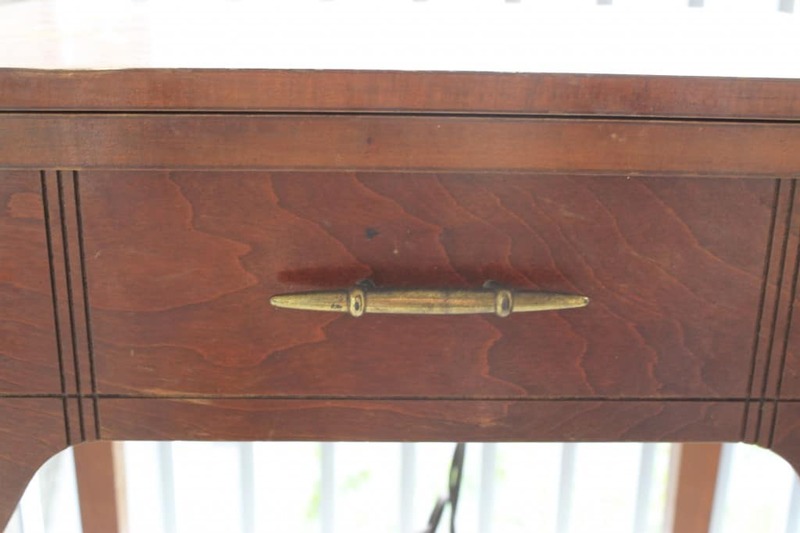 It also was the same depth as the sides of the table so it would be hidden. We also went to Lowe’s and got some brackets and hooks. 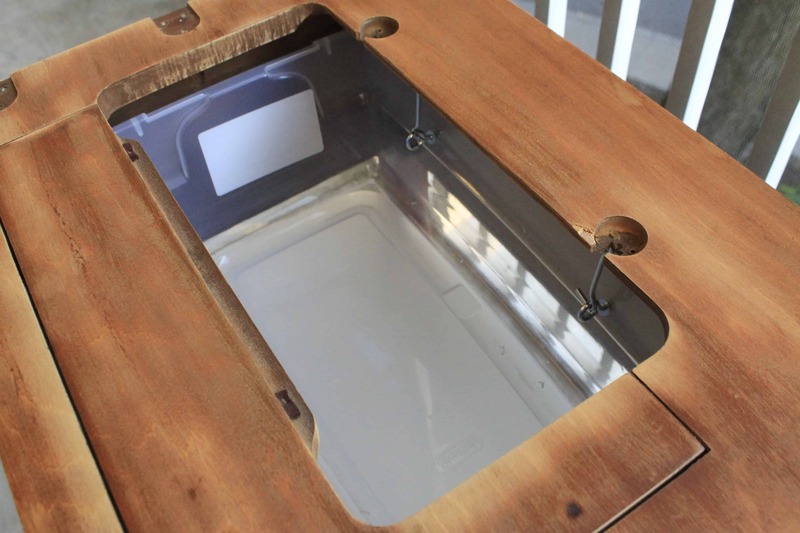 The plastic tub would be used to fill with ice and drinks! 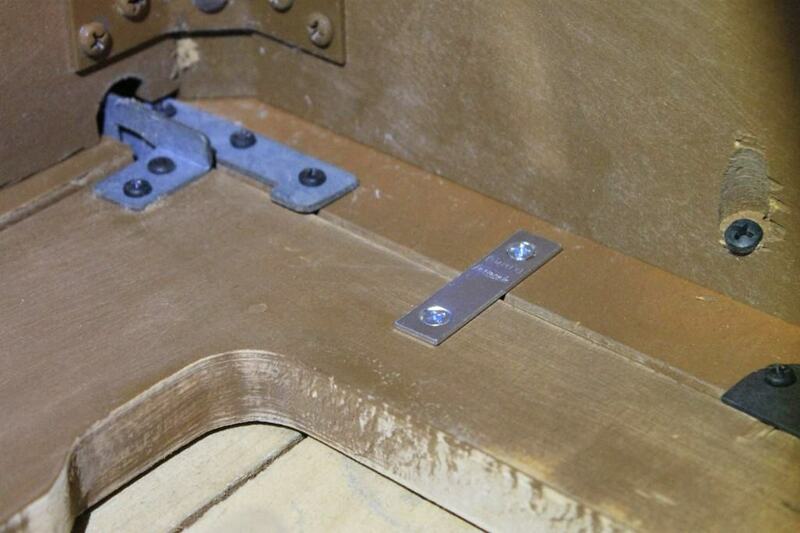 First, we used flat brackets to secure down a folding piece of the table that needed to not be able to open anymore. 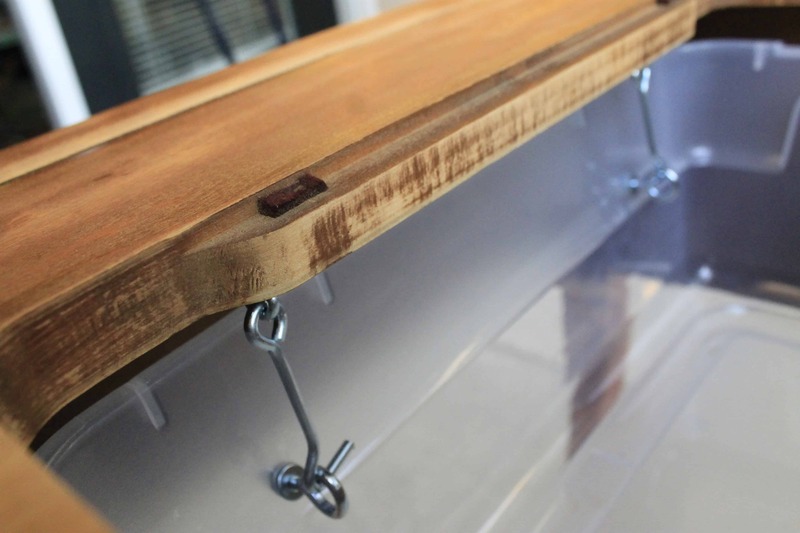 After measuring it out, we screwed the dangling hooks into the underside of the table. 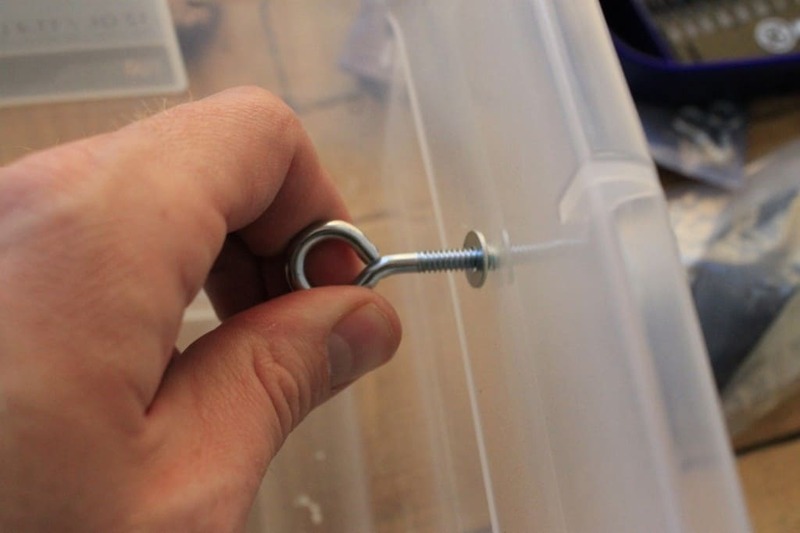 We screwed the eyes for the hooks to go in into the bucket. We used washers on the bucket to help the eyes not tear through the plastic. 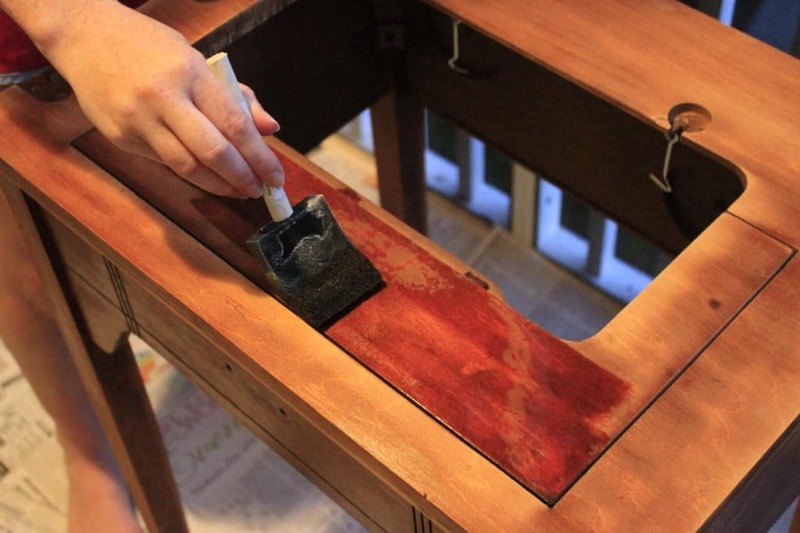 Next up was to make the whole table look like new again. We thought about painting it. 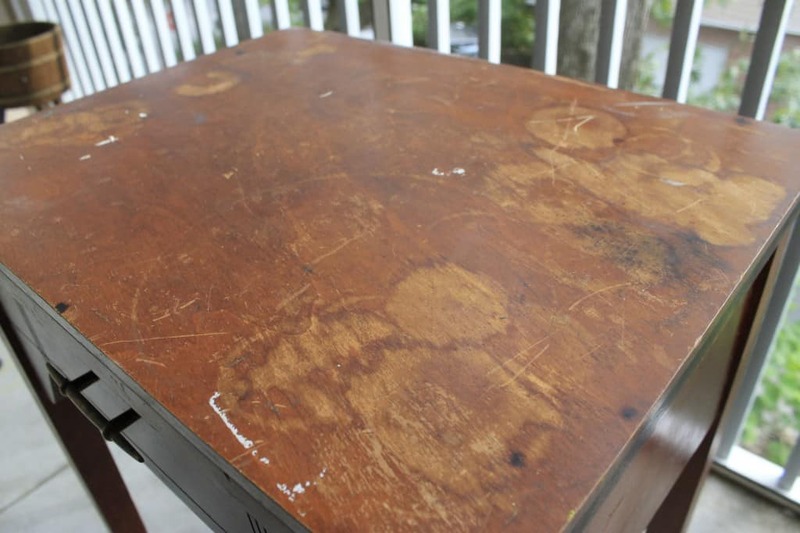 But, when you have a piece of furniture that is made entirely of real wood, a better option is often to stain it. 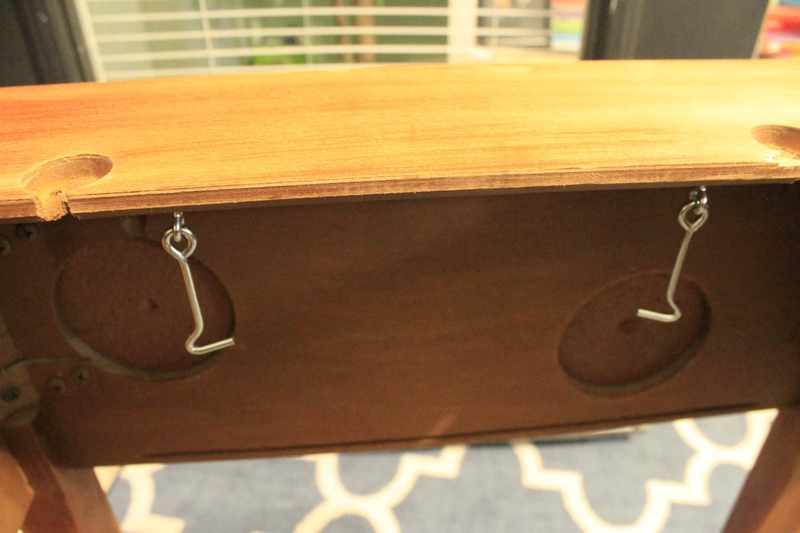 We chose a dark walnut color that we had previously used for a bedside table and our string art board. 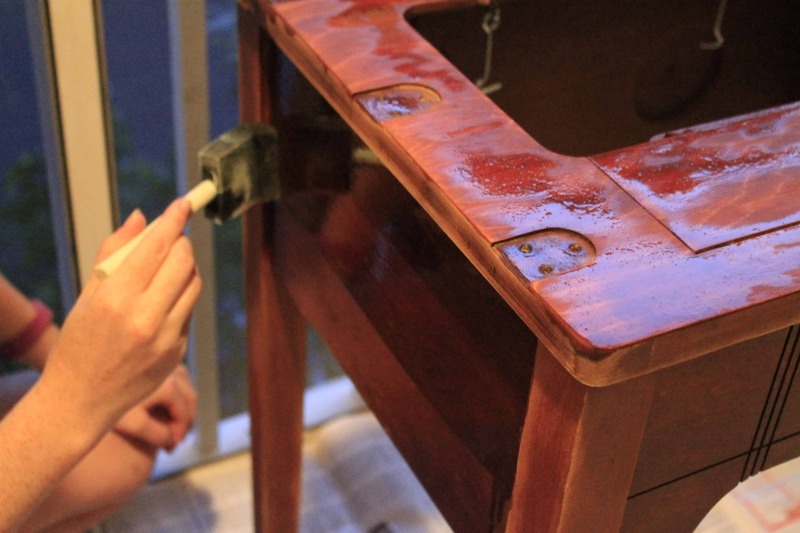 This color is great because it makes the wood look authentic and you can still see the grains of the wood. Since we knew the table would be used for drinks, we also sealed it. 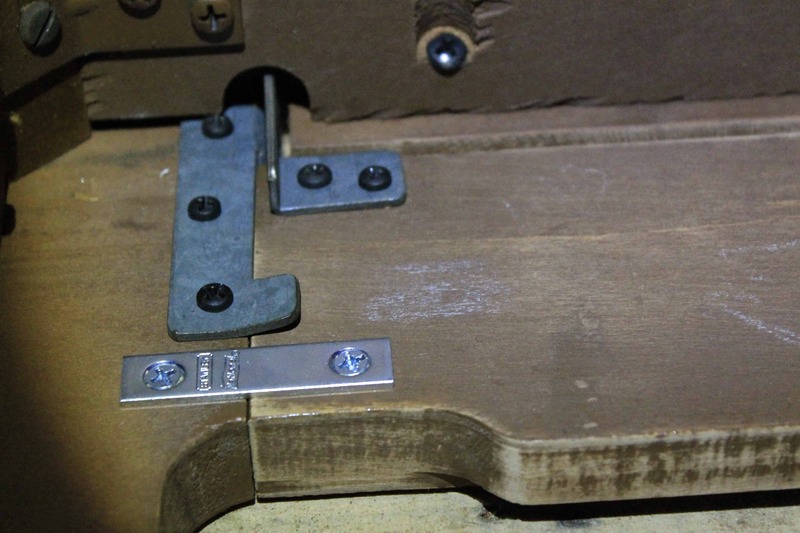 Finally, we installed an updated handle on the front. 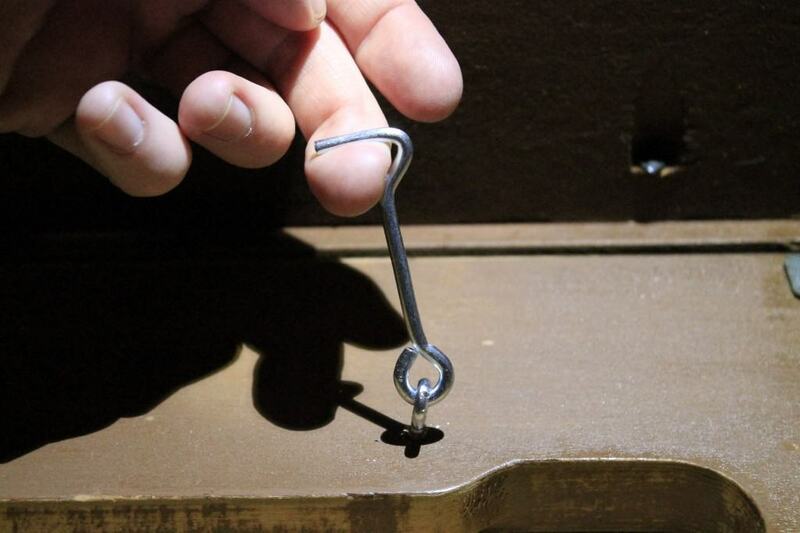 The handle isn’t actually for pulling, but merely for aesthetics. Then we reattached the folding top and stood back to admire our work! Just take a look at how it can be used for a party! In the end, we spent $10 for the supplies for the transformation. 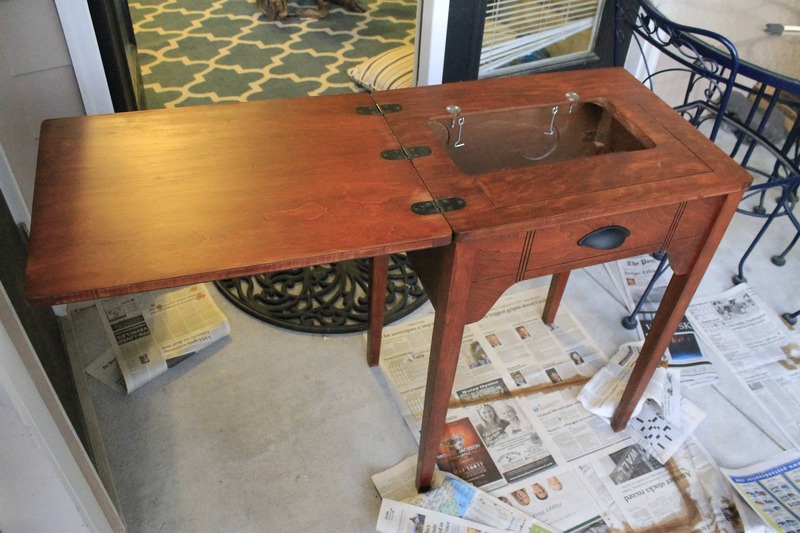 Added on to the original cost of $15, we estimate that the table can now be sold for $40. This is a great boost for Palmetto Goodwill! We had a great time with this project (knocking off number 27 of our 101 in 1001 list) and it feels good to be helping Palmetto Goodwill. 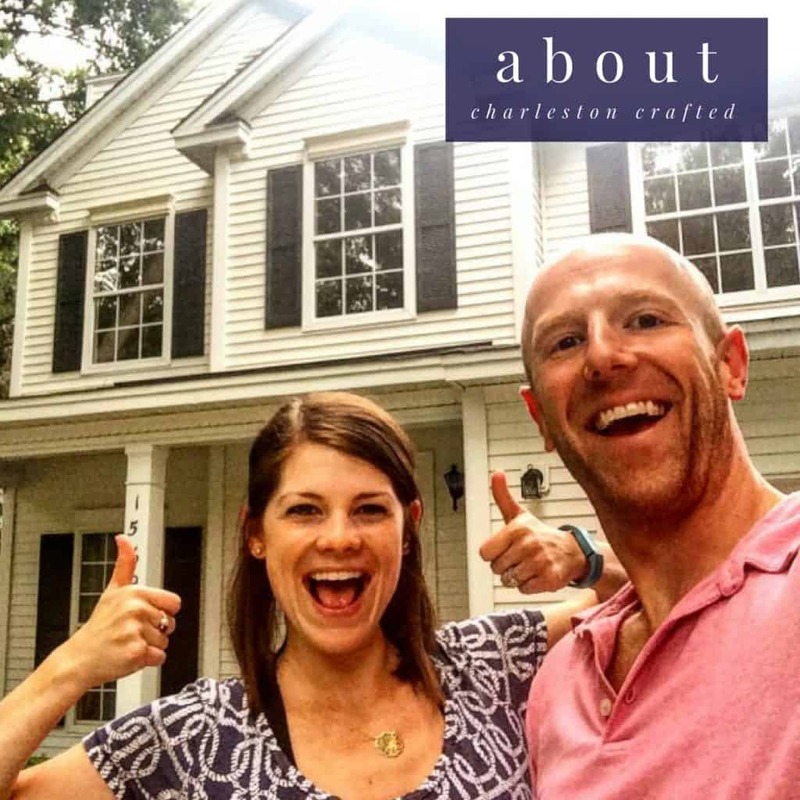 Be sure to keep up with our collaboration with them and follow their blog as well. 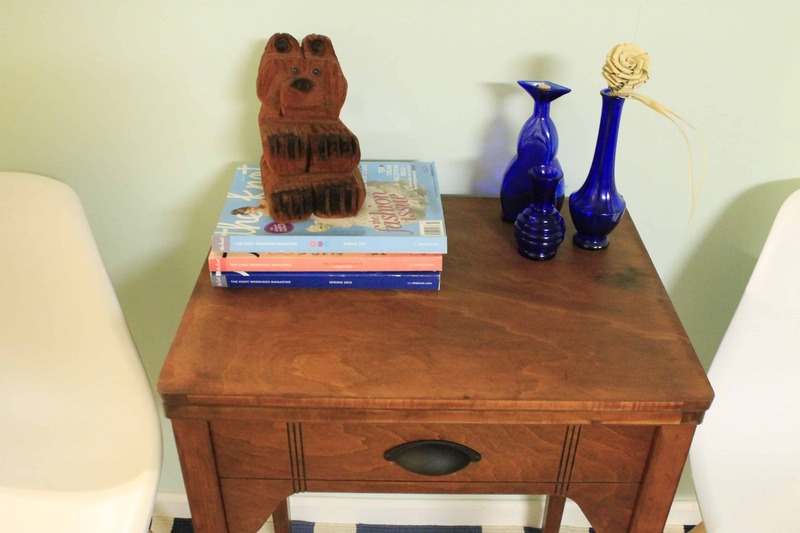 They will be featuring our furniture makeovers as well as an exclusive content blog post from us each month! 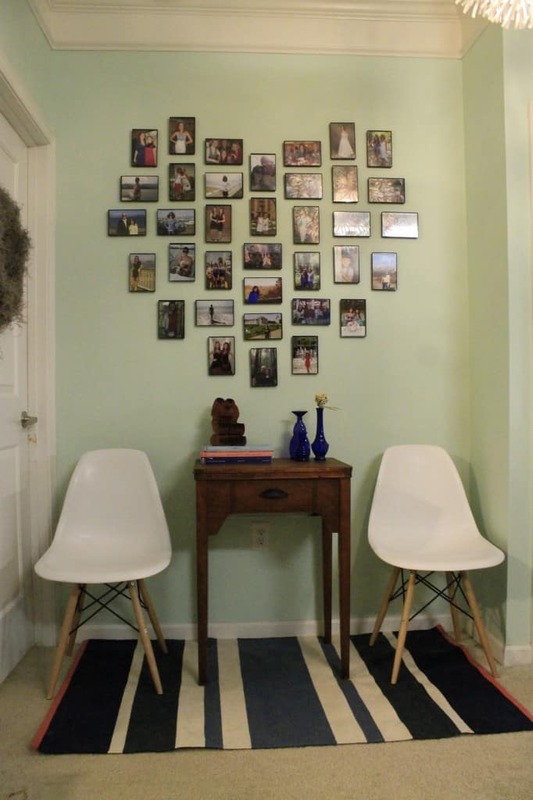 What a genius way to repurpose athe otherwise sad looking piece. 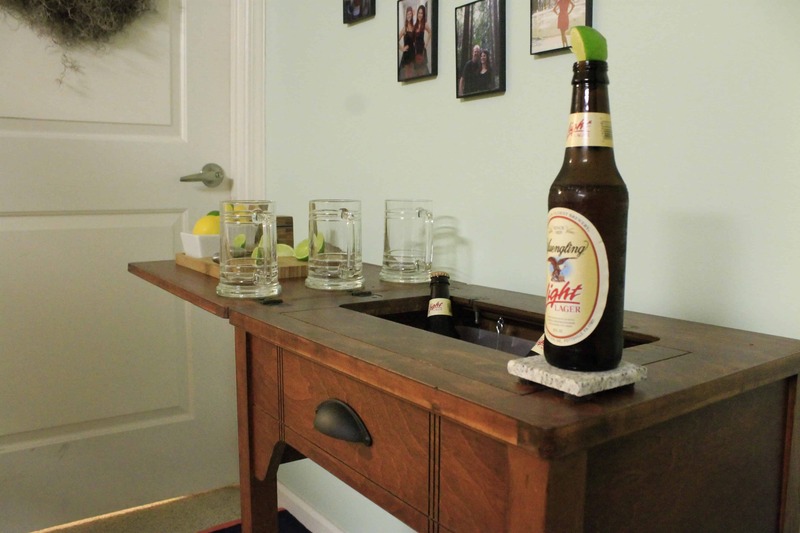 I especially adore that it serves as a surprise bar and folds back down for small spaces!! Thanks Trisha! 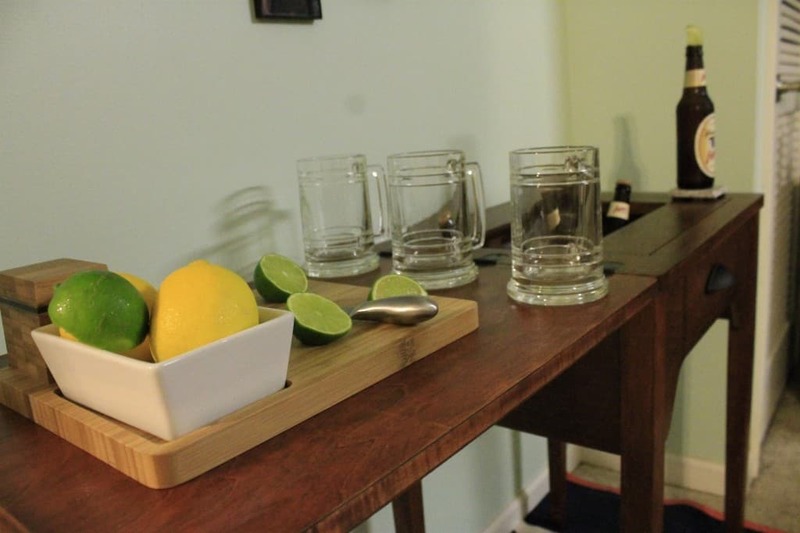 Yeah, we think it looks great and I really hope it’s a great conversation starter for people when they host a party. Wish we could have kept it! Thanks for stopping by. Love this! I’m in the process of re-doing one that looks very similar for my mom’s birthday. 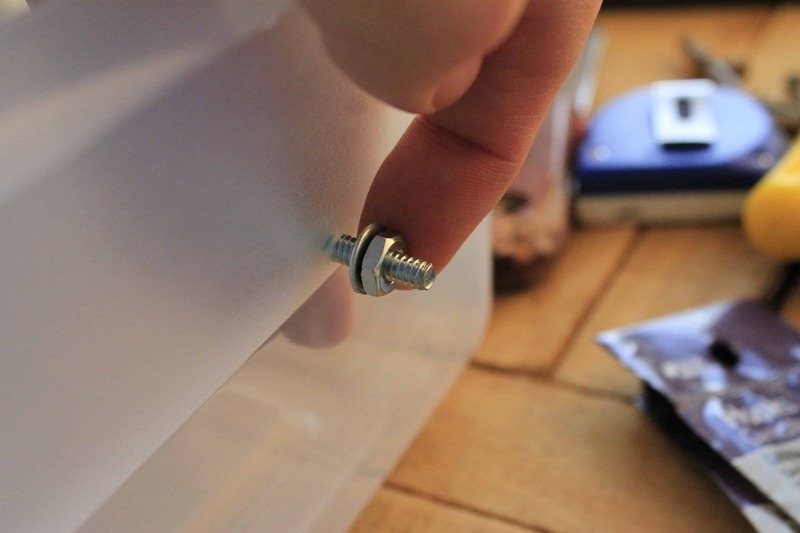 I think I’ll steal your idea of using hook-and-eye fasteners to hang the plastic bin. I’ve been trying to figure out how to do this! Thanks! yay I know it will turn out great! !